Now and Then is a community heritage wiki website created and maintained by the people of Willunga, South Australia. You are welcome to join and share your knowledge, memories and stories of Willunga. Create your account and join in today! Click the colored pins on this interactive map to find stories in this wiki. Blue pins mark places. Green pins mark organisations. Red pins mark events. Try zooming in or out, shifting the view to see more, or switch between the map or satellite view. 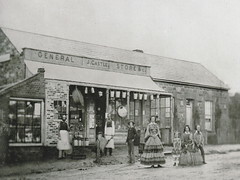 Browse the articles - click on Places, People, Events, Organisations or Things at the top of this page to connect with articles about historic Willunga. Discover Willunga's remarkable heritage with the Willunga Walks mobile app available for iphone, ipad and Android devices from the Google Play and iTunes App stores. Download the app and take a self-guided trail to explore dozens of interesting places at your own pace. Star of Greece Shipwreck This page will keep you informed of events, information and news concerning the Star of Greece Shipwreck. 2018 is the 130th anniversary of the disaster. The Willunga Branch of the National Trust holds a unique archive of Willunga's local history which is accessible during museum opening hours. We welcome enquiries from family historians and other researchers. 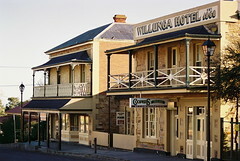 In 1868 James Castle, storekeeper and previous licensee of the Old Bush Inn, opened the Willunga Hotel next to his general store. The Hotel was a popular refreshment stop and meeting place for locals and visitors who arrived in goods wagons and passenger carriages. The Quinn family ushered in a new era at the Willunga Hotel, owning it for fifty-two years until 1947. The women of the family were the mainstays of the business. Every Sunday and the first Tuesday of the month 1-4 pm. We welcome contributions of stories, photographs and other memorabilia. 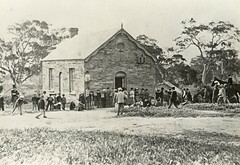 Courthouse and Police station, Willunga, 1880s. Stables, Willunga Police station, 1920s. Industry, Law and Order in a 19th Century Community. Explore our permanent exhibitions to learn the story of Willunga’s slate industry since 1840 as shown throughout our Slate Museum. Gain insight into our social history, especially relating to Law and Order, as shown through our Courthouse Museum: Family history material is available. Download Willunga Walks app to explore historic Willunga. 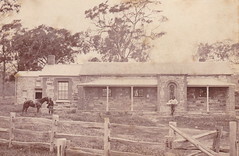 Bassett Boys Schoolroom, Willunga, c. 1865. The Slate Carving Identification Project has been established to identify and record Willunga slate carvings from the nineteenth century. All we would like to do is identify and photograph the carvings for further study. A Happy Outing? Maybe not! 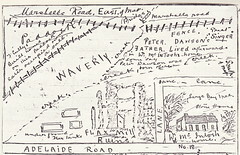 Join us on Flickr to find more images of Willunga's history and share your own!